Discussion in 'Elementary Education' started by Mr. Happy, Jan 25, 2013. I don't even know where to start. I currently teach 5th graders. The problems I face lead me to the thought of quitting. I feel so frustrated because I am not teaching effective to the students who need the most help. I know I need to work harder on my planning so I can teach everyone and not just the students who will automatically get the lesson. My classroom management needs a lot of work as well. Students disrupt me a lot when I am giving directions that they don't know what they are supposed to do. I have worked with a coworker on my classroom management plan but at times I get so frustrated that I skip straight to tell kids I will call their parents. Not only this, I am behind in my paperwork and have missed some deadlines for my weekly plans. I know my principal is trying to help but I keep on shooting myself in the foot when I miss these deadlines. I feel like I have made the biggest mistake to become a teacher. I became a teacher to make a positive impact on the students, but I feel like I am just wasting their time. I feel so hopeless right now. Your post reminded me of my first year teaching. I, too, taught fifth grade and I can clearly remember that feeling about half way through the year of "sinking." At the end of every day I felt like my head was just barely sticking out of the water and that any moment I would go under for the last time. 1) You MUST realize that the behavior of your students doesn't have to be a reflection of your abilities as a teacher, inspiration, or good role model. For good classroom management, you really only need 3 things- rules & consequences, a plan to carry these out, and consistency in doing it. I tried EVERYTHING. Finally I have found a system I have faith in. I have a stack of drink coasters (I call them "cards") on my desk. A misbehavior results in one card. I place it on a student's desk. Another misbehavior results in another card. Simple as that. You misbehave, you get a card. You argue with me about it you get another one. One card costs 5 minutes recess. Two cards cost 10 minutes recess and a note goes home that must be signed or you don't get any recess the next day and I call home. Three cards and your desk is moved away from the rest of the class. Four cards and you lose out on any "fun" or "group" activities we do that day. Five cards gets you a trip to another classroom for time out and you must complete your work plus some practice work while there. It will coincidentally be the same classroom your sibling is in whenever possible =) At the beginning of the year we discuss why rules are important and the kids help me come up with three rules we will use in our classroom. Then they and their parents sign a contract stating they will follow the rules and understand and agree to the consequences if they don't. I do have to explain the system clearly (like having students know that if I place a card on their desk they must not touch it) early on and teach them how it will work. But the most important part of my management plan is that for every procedure I demonstrate the right way to do it, the wrong way to do it, and the not quite right way to do it. I explain that the right way is the only acceptable way. Then I am consistent with the consequences. If I say, "No talking during the test" and someone calls out to ask a question, I give them a card. Even if it was an "accident." On the other hand, I give them plenty of time to discuss things with partners or groups and time to move around within instructional time so that following the rules isn't impossible or painful and I try to make instruction engaging so they want to participate and learn! Also- don't "skip" a step. Even if they get on your last nerve, only dole out the agreed upon consequence. Let them know that there are exceptions- hitting, name calling, bullying, etc. warrant more than a card! But for regular misbehaviors, just give out consequences- don't lecture! It wastes your time and they already know what they did was wrong. Let them know ahead of time if they argue with you about receiving a card, they will receive another card (which warrants a note home). At any rate, just look at it as they are making choices and you are honoring their choices. At the end of the day, take up the cards and start each day fresh. Don't bring up past issues. 2) Teach to the students who usually struggle and the others will get it on their own. Most of the time, anyway! Don't be afraid to ask them questions or have them come to the board to work a problem or explain things. Just remember to dignify their learning errors- figure out the things they DO know and build from there. Take the time to let them work through it! 3) Do what is most important FIRST. If you have deadlines, meet them. Worry about doing the "extras" later when you have some experience under your belt. 4) One thing I've learned to do to save time is to find ways to let them practice that don't have to be turned in and graded- use white boards and markers or oral answers or gestures (thumbs up, thumbs down, etc.). It's also ok to have them grade some of their own papers and just take them on home after you glance at a few to see what you need to know. Assign groups to work on things and make sure you have a high student in each group who can help teach the lower ones! Don't give up!! The first year is by far the most difficult! If you can make it through, you're on your way! I stayed at school that first year from 6am to 6pm most days and was still overwhelmed! I promise it gets better with experience! The first year, no matter what grade, is ROUGH unless you're some kind of Student Whisperer. To be honest, my second and third years were a bit rough too, but when I look back over the last seven years, I can honestly say it got a little easier each year. I'm sure some teachers and principals will disagree with me on this but the most important thing (before test scores, meeting deadlines, grading papers, establishing a great repor with parents, knowing the curriculum, etc) is CLASS MANAGEMENT. You can be the most engaging, well-prepared teacher ever, but if you can't get the kids to (for lack of a better word) "shut up and listen" the job will feel impossible. When I first started teaching, I had second grade. I'm a great presenter, but I couldn't get the kids to be quiet unless I shouted at them and even then, it only lasted for a few seconds. Someone was always talking, sleeping, drawing pictures, etc. I was hoarse most of the school year and I must have caught at least 12 colds because as my stress levels go up, my resistance to germs goes down. This is the management system that I put in place that works for me. My categories are "Superstar, Good, Warning, Time Out, Call home/Office". I have a clothespin with each child's name. All the students start out on "Good". To get to superstar, you must remain on "good" the entire day. If you misbehave, you have your clip moved down. 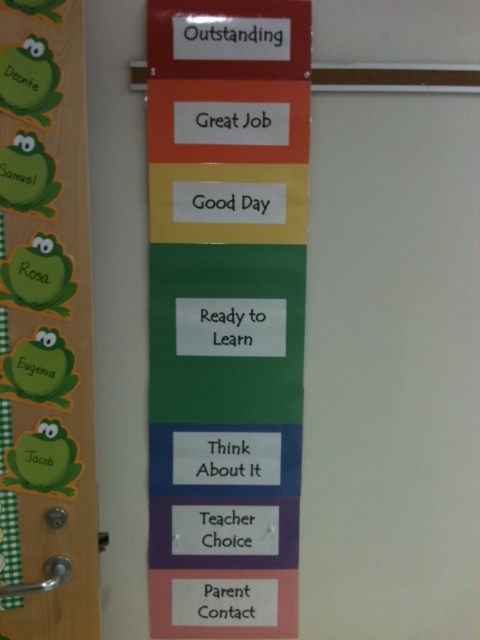 Some of the other teachers disagree with this, but I allow students to "move back up" to a better color throughout the day. The reason: I used to keep them on a bad color for the day and what I found would happen is a kid would have no motivation to get their behavior together. They'd figure, "Well heck, I'm already on blue, I might as well keep throwing pencil lead at people." If it's a minor misbehavior or a child who does not act up regularly, I'll let them move their color back up within 10 - 20 minutes of them showing me improved behavior. 1. If it's a frequent offender who engages in the same misbehavior even after their clip is moved, then I won't let them move back up until after recess. 2. If it's a severe misbehavior. Last year I had a kid who would kick other students on the carpet, curse at them during story time. When I'd send him back to his seat from the carpet, he'd purposely step on people's hands, shove them and attempt to turn his desk over on them. He wasn't allowed to "redeem" himself from those kinds of misbehaviors, but thank god most kids aren't THAT bad. EDIT: I forgot to mention you should ALWAYS follow through with threats, especially at the beginning of the school year. I used to threaten "I'm going to call your parents" or "You're going to have to move your color" etc but I didn't follow through, so the kids stopped taking me seriously. It's hard and requires a lot of discipline, but in the long run it's worth it. Now, I make threats and the majority of my kids immediately correct themselves because they know if I say I'm going to take recess/call a parent/call the office, I'll do it. I tried many different systems, including this particular one. I didn't like it because it took too much time from instruction- some kids would stomp over to the clip chart and angrily huff as they moved their clip...one always tore the whole chart down and stood there looking at me defiantly. I like the card system because it takes zero time- I can place a card on a desk as I move around the room and I don't have to remember to have the kids move their clips back up or have them constantly asking me if they can move back up. I just give them a card. They get the consequence, and life goes on. That said, I say find a system that YOU can live with and believe in and use it consistently. Sounds like you've found yours! I forgot to mention you should ALWAYS follow through with threats, especially at the beginning of the school year. I used to threaten "I'm going to call your parents" or "You're going to have to move your color" etc but I didn't follow through, so the kids stopped taking me seriously.